So what does the the future hold for the one time darling community in North Fulton? I drove out yesterday to get some photos for this report and to look around and see how development was coming along. It's been about a month since I had actually stopped and got out of my car and I tried to look at the area from a potential buyers eyes to get a different take on it than what I usually see from my perspective. I still really like what I see. The architecture, thoughtful use of space, and continued development of the businesses still feels like it will turn in to a small community bursting with energy and a positive marriage of the best parts of what many people yearn for from the past combined with today's amenities and sustainable eco-growth that show the forward thinking originally envisioned in the plan. Along Crabapple Road west of Broadwell, retail business space continues to be built (this is a photo of the north side of Crabapple) and John Wieland is building in Braeburn - 4,000 + square foot homes with an entrance off of Birmingham Hwy just north of Crabapple. They aren't listed in the MLS yet to try and save some money on fees, I suppose, but, they are building and prices on their website have already dropped $40,000 and $50,000. All of this does bide well for buyers in the new year, but, there are definitely some cold feet. Buyers will need to get warmed up before we see the area reach completion. There are large areas containing nothing but empty lots. This is really a big part of the problem. Unlike in the past when buyers looked at a new community like this and thought that if they didn't buy right now prices would only go up, they now feel like if they wait, prices will go down. What would you do if you were in the market right now? The answer really depends on your situation. It might actually be the right time to buy for you or maybe it isn't, but, there are too many factors to consider in this article. I would suggest you give me a call if you want to talk about it and see if it would make sense for you. There are up and down sides and risk and other factors to consider even in what is one of the more thoughtfully designed neighborhoods in North Fulton. This sign in the center of Crabapple Crossroads represents the essence of the location and is part of what makes the Crabapple Overlay District one of the gems moving forward. Literally walking distance to dining, shops, schools, church and new friends, the area is a model of sustainable development. 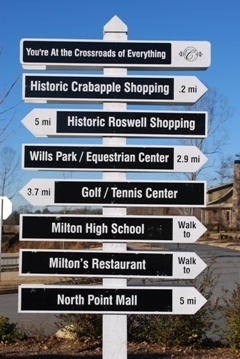 Convenience and easy access - by foot even, make this area of Milton different and attempts to improve the quality of life issues many people object to about living in North Fulton. Its for these reasons that the long term outlook for the area, in my opinion, looks better than it does for some of the other nearby areas that can't boast or make claims of convenience and smart growth like that which can be made here. Crabapple Crossing still has a few vacant lots left to build on with one resale, Crabapple Crossroads has a wonderful selection of homes finished and waiting for someone and Crabapple Station has one just about completed and room for a few more homes. 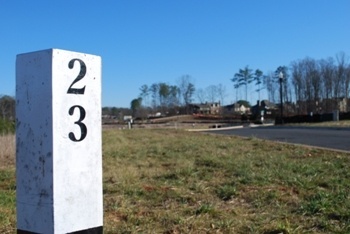 There are lots left on the south side of Crabapple and a full tract of lots left on the north side waiting to be built once the market balances out and inventories return to more normal levels. All in all, if you haven't been out to the area and you are in the market for a home right now, I strongly suggest that you consider at least looking at these homes. Given the current market conditons, you might find yourself able to negotiate a solid value and a home and area worth living in for many years to come. I thought I saw them started on the model, but admittedly, I was on the phone when I drove through the entrance off of Birmingham so I may have been looking at something else - maybe a model? I'll check tomorrow. What Lodestone did with the Ellard Mercantile Exchange turned out great. I expect Crabapple to be just as nice when complete. I couldn't believe they started them either. Either someone is riding through town with blinders on or they believe that if they build it, people will come. I think these "centers" are overdue for the area and if Alpharetta can ever get the City Center going it will really add to the liveability of the overall area. I think it would also help Crabapple. Giving residents up here a reason to feel "community" and a reason to stay near home the way many intown neighborhoods are and residents do is definitely missing - as long as they can merge the businesses in the right way. I think they have been succesful in Crabapple. Have you eaten at the Little Azios? "at least there is going to be an ice cream store finally in Crabapple and an Irish Pub"
I hope people don't take that comment as silly becasue I think that is the essence of what people are looking for and will be partly responsible fo the success. They are going to be recording the plat at Braeburn towards the end of January/early February and then they might build one out. Another reason to not be on your phone while driving - the sales center is DEFINITELY NOT a model...rumor has it they have a presale at over one million dollars - we'll see if that comes to fruition. What a gorgeous community. I live in Morgantown WV, and fortunately we have not experienced the drastic downturn comparatively however, we have been effected. Mixed use developments such as Crabapple really starting making their debut about 4 years ago. A lot of out of town Developers came into the area and started going gang busters. The problem here, being a large University Town most of the available land has been overbuilt with student housing. That coupled with lax zoning and no zoning in some area's has really caused some problems. The price of raw land went through the roof and the topography is not favorable for large scale mixed use. Although there are several Developers in the area going at it and putting up strip centers they are not all complete and I wonder what the outlook will be once they are. Could be the right time to buy, but then again most people are inclined to think not. If only there was some sort of all knowing sign! Looks like its a community with a future ! We have a couple like that here. The buyers are all scared stiff. They will shake it off and buy in the year ahead - the rates will be down. Good Luck with the new year! I feel that now IS the right time to buy. But I'm still all for Sharon's all-knowing sign--for every other question in my life!